In the intriguing Ezekiel 38 & 39 Gog/Magog war prophecies, God has hidden his meaning similar to how Jesus hid his with his parables (Mk 4:10-11). Since these two consecutive chapters are so similar, the consensus is that they are the same prophecy of a single attack on Israel by the same "Gog." Find out why there are actually two Gogs and two wars indicated there through a parallel prophecy in Revelation—1000 years apart. Most assume the two chapters speak of the same war. Using current events as their guide, they focus on identifying who Gog is or the location of Magog. This approach usually leads to the wrong conclusion about identities and also the timing. That's why people have been thinking for decades that this war is near or already under development—and yet it never materializes. Why not? It could have something to do with the assumption the two chapters are the same war. It seems unnatural that God would inspire Ezekiel to write about two such similar Gog attacks back to back and not make it clear to the reader. Certainly God would want to eliminate any obstacles to understanding his Word lest people get discouraged and give up. Certainly he would not make anything hard on purpose. Or would he? Did God purposely inspire some passages in a way that would easily lead most readers to misunderstand them in order to "seal" things up? The Bible actually teaches this principle. I'm convinced that Ezekiel 38-39 is a good example of this aspect of the Bible that makes Bible prophecy so hard and confusing to everyone. The suggestion that God has any intention other than that we all read and easily understand the Bible may sound absurd or at least counter-intuitive. However, the Bible plainly declares this. Both the OT (Isa 6:9-10) and NT (Mk 4:11; Mt 13:11; Lk 8:10; 10:21-24) reveal that God's word is difficult and mysterious on purpose. The reason given is in order to hide its secrets from the masses so that they would not all be convicted (yet) "to turn and be healed" (John 12:40). Since idea runs counter to what you would expect, it helps greatly to be aware of it as you attempt to read the Bible. Studying the Bible is hard enough without having the wrong expectation that it should be easy and "very clear" (as you no doubt have heard some claim about what they think the Bible teaches). Let's face it, the Bible is anything but easy. It is a huge and a very difficult book containing more red herrings, mysteries, enigmas and puzzles than you would think. An example of the Bible containing mysteries is found in Revelation 13:18. It enigmatically says, "let him that has understanding count the number of the beast...a man...his number is 666." That's a riddle. It does not come out and explain it, but it can be deduced that the "understanding" needed relates to how to apply Hebrew gematria to a name, especially a modern name from a non-Hebrew language. If you find a ruler whose name computes using the right values for the letters to 666, you may have identified a possible candidate for the Beast . Of course, it must be stated that the inclusion of riddles in the Bible does not mean one needs to be a scholar to understand its basic simple truths (salvation, grace, forgiveness, repentance, etc). 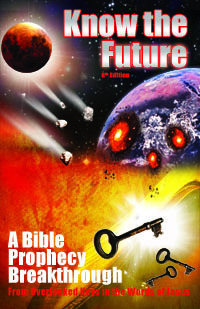 It just means that if you dare to understand end time prophecy and thereby know the future or other deep mysteries that only Bible prophecy can reliably reveal, then be on your guard for some curve balls in what you are reading. Ezekiel 38-39's Gog/Magog prophecies would not be categorized as one of the simple truths that are easy to understand. Once you understand the true meaning of these prophecies, it's easy in hindsight to see why they were so difficult. God has ingeniously placed two very similar prophecies right next to each other in the Bible. For several good reasons, most readers naturally assume that these two consecutive chapters are one prophecy speaking of one event. First and foremost, the chapters have many major parallel elements. Both speak of an attack on the land of Israel from the land of Magog or Meshech and Tubal. Both involve many nations besides just Magog. Both wars end quickly with the complete defeat of Magog through God's intervention. To make matters worse, the name of the person leading the attack is also the same in both chapters: Gog of Magog, chief prince of Meshech and Tubal. If it only said that the same nation was attacking Israel more than once, it would not be so tempting to merge the prophecies. Israel's neighbors have attacked Israel repeatedly throughout history. "History repeats itself" as we all have heard said. But the fact that we apparently have the same man leading the attack in both chapters makes it less likely that there are two separate attacks. A man only lives so long and preparing for another attack takes time. Plus, in both chapters, Gog and his nation are soundly defeated. The saying, "he who fights and runs away lives to fight another day" does not apply here. Thus, it seems reasonable to conclude that there is only one attack by Gog on Israel and it is expressed twice in the two chapters, just as the most popular accepted theory says. The "One Gog/Magog War" interpretation seems reasonable until you dig deeper and find an overlooked difference between the two chapters. Of course, it's not enough to just find any difference in the details between the two chapters. You need to find a clear contradiction between two passages that renders them not just different but incompatible. For example, it would be a mistake to say that since one chapter mentions Gomer joining with Magog and the other does not, that therefore the chapters speak of two different events. The Bible does not work that way. If you attempt to use that type of "unforgiving matching logic," you'll come up with all kinds of incorrect theories, such as there being more than one rapture, or more than one 144,000, etc. Instead, when you read the Bible you have to use a more flexible or forgiving matching logic so that you merge compatible differences between accounts. If one passage mentions details A and B and another passage says B and C then rather than judge them not the same event (A, B ≠ B, C), you have to consider the possibility that they might together be describing the same entity with aspects A, B and C. The harmony of the Gospels, or the attempt to merge what is known for sure to be the parallel passages of Jesus life, uses similar matching. Nevertheless, there just so happens to be an irreconcilable difference between Ezekiel 38 and 39. The difference has to do with who is in the land of Israel at the time of each war. Let's look at the two chapters in detail to highlight this difference. Ezekiel 38 gives special details about the status of Israel when Gog attacks. Completely Regathered - Magog attacks an Israel regathered completely from the nations. The importance of this might be lost on those who do not understand the "Two Houses of Israel" in the Bible compared to who is living in the land of Israel today. Israel today is inhabited only by the Jews, about half of the worldwide population. The Jews themselves are only some of all Israel. They are the (southern) House of Judah (Judah, Benjamin and Levi). The Lost Ten Tribes (LTT) or (northern) House of Israel makes up the bulk of all Israel. The LTT are still lost or mixed in among the nations where God scattered them in punishment (Dt 4:27; 30:3; Ne 1:8; Jer 31:10; Eze 6:8; 12:5; Joel 3:2; Zec 7:14; Jer 37:21). Defenseless Yet Secure - Before the attack, Israel is living peacefully without any fortifications or thought to defense at all. Of course, this is the complete opposite of the picture of Israel security today. In fact, ever since the founding of the modern nation of Israel in 1948, Israel has been at war or preparing for war with her enemies or suffering from civilian terrorist attacks. As a result, military service is mandatory for both male and female Israelis. Israel even has constructed a literal defensive barrier hundreds of miles long consisting of part "wall" and part fence. Clearly Ezekiel 38 does not describe the Israel of today. More importantly, as we shall see, it cannot be describing the same Israel as Ezekiel 39 describes Gog attacking. Now, unlike Ezekiel 38, Ezekiel 39 does not give any details about the "mountains of Israel" that Gog attacks. But it does describe major developments directly resulting from God's victory. These changes indirectly tell us what we need to know about the nation of Israel attacked by Gog in Ezekiel 39. Ezekiel 39:20-26 (HCSB) — 20 At My table you will eat your fill of horses and riders, of mighty men and all the warriors.” 21 “I will display My glory among the nations, and all  the nations will see the judgment I have executed and the hand I have laid on them. 23 And  the nations will know that the house of Israel went into exile on account of their iniquity...25 “So this is what the Lord GOD says: Now  I will restore the fortunes of Jacob and have compassion on the whole house of Israel... 26 They will feel remorse for, their disgrace... when they  live securely in their land with no one to frighten them. 22  From that day forward the house of Israel will know that I am the LORD their God. Firstly, the nations know that their defeat in the war was judgment by God's hand to his glory. Thus, we can see that the regathered and secure status of Israel in Ezekiel 38 is a direct result of the Ezekiel 39 war and aftermath! If Ezekiel 39 is a prerequisite to the conditions of Ezekiel 38 then obviously this means that these two wars cannot be the same war but must be two separate wars. As promised, it's not hard to figure out the timing of both Gog/Magog wars once you realize they are not the same war. However, the second war is the easier of the two to figure out, so we'll start with that. If Gog/Magog War #2 happens to a safe, secure, regathered Israel, then there is only place where it can fit. The Second Exodus regathering of all Israel takes place at the start of and during the Millennium (Jer 16:14-15). The Millennium  is known as 1000 years of peace. That means the war must come sometime after the Millennium ends. Revelation 20:7-9 (HCSB) — 7 When the 1,000 years are completed, Satan will be released from his prison 8 and will go out to deceive the nations at the four corners of the earth, Gog and Magog, to gather them for battle. Their number is like the sand of the sea. 9 They came up over the surface of the earth and surrounded the encampment of the saints, the beloved city [Jerusalem, Israel]. Then fire came down from heaven and consumed them. Ezekiel 38:22 (HCSB) — I will execute judgment on him with plague and bloodshed. I will pour out torrential rain, hailstones, fire, and brimstone on him, as well as his troops and the many peoples who are with him. However, fire is indeed mentioned in both accounts and everything mentioned is related, being precipitation. Revelation 20 is just a very abbreviated (two verse) account of the war. As such, it is reasonable that it only mentions one thing (fire) and not all the other precipitation God sends to fight Gog/Magog. Ezekiel 39:7, 22, 28-29 (HCSB) — 7 So I will make My holy name known among My people Israel and will no longer allow it to be profaned. Then the nations will know that I am Yahweh, the Holy One in Israel. ... 22 From that day forward the house of Israel will know that I am the LORD their God. ... 28 They will know that I am the LORD their God when I regather them to their own land after having exiled them among the nations. I will leave none of them behind. 29 I will no longer hide My face from them, for I will pour out My Spirit on the house of Israel. There is only one time in God's plan when you could say that God will no longer hide his face, will reveal himself to all the nations, reveal his name and no longer allow it to be profaned, and will regather all Israel to their land and pour out his spirit on them all (Joel 2:18-29). That time would be the Millennium, or the 1000 years of God's Kingdom of resurrected immortal glorified saints ruling on the earth (Rev 20:4). Ezekiel 39:8 (HCSB) — Yes, it is coming, and it will happen. This is the declaration of the Lord GOD. This is the day I have spoken about. Ezekiel 39:3-4, 17-20 (HCSB) — 3 Then I will knock your bow from your left hand and make your arrows drop from your right hand. 4 You, all your troops, and the peoples who are with you will fall on the mountains of Israel. I will give you as food to every kind of predatory bird and to the wild animals. 17 “Son of man, this is what the Lord GOD says: Tell every kind of bird and all the wild animals: Assemble and come! Gather from all around to My sacrificial feast that I am slaughtering for you, a great feast on the mountains of Israel; you will eat flesh and drink blood. 18 You will eat the flesh of mighty men and drink the blood of the earth’s princes: rams, lambs, male goats, and all the fattened bulls of Bashan. 19 You will eat fat until you are satisfied and drink blood until you are drunk, at My sacrificial feast that I have prepared for you. 20 At My table you will eat your fill of horses and riders, of mighty men and all the warriors.” This is the declaration of the Lord GOD. Revelation 19:17-21 (HCSB) — 17 ...an angel ... cried out in a loud voice, saying to all the birds flying high overhead, “Come, gather together for the great supper of God, 18 so that you may eat the flesh of kings, the flesh of commanders, the flesh of mighty men, the flesh of horses and of their riders, and the flesh of everyone, both free and slave, small and great.” 19 Then I saw the beast, the kings of the earth, and their armies gathered together to wage war against the rider on the horse and against His army. 20 But the beast was taken prisoner, and along with him the false prophet, who had performed the signs in his presence. He deceived those who accepted the mark of the beast and those who worshiped his image with these signs. Both of them were thrown alive into the lake of fire that burns with sulfur. 21 The rest were killed with the sword that came from the mouth of the rider on the horse, and all the birds were filled with their flesh. Yes, this is the famous "Battle of Armageddon" of Revelation 19. It happens when Jesus returns with his glorified raptured saints from heaven (as pictured earlier in Rev 15) to destroy the Beast and his armies. Just like Ezekiel 39, it goes into great detail about how God has prepared a feast of kings and their armies for birds and beasts to dine on. And just like Ezekiel 39 alludes to, this prophecy is immediately followed in order by the Millennium when God rules on earth and reveals himself to all (Rev 20:4). Of course, one could raise several objections to these prophecies being parallel. People viewing this prophecy too narrowly would say that Ezekiel 39 does not fit Armageddon because Armageddon involves all nations (Zech 14:2, 16), not just Magog. However, Ezekiel 39:4 mentions "many peoples" with Magog and even the "judgment hand" of God on "all the nations" as part of this prophecy (Eze 39:21, 6). Thus, it's not just a Magog vs Israel war as the first few verses of Ezekiel 39 might lead you to believe. Magog as the only nation specifically named in Ezekiel 39 could be because it is the leading nation. If it is many nations as it says, it still can fit Armageddon since Armageddon is "all" nations which unavoidably would include Magog. Others would complain that Magog comes from the north while Armageddon involves nations coming from everywhere. But, again, with careful reading you will note that it does not say all the nations with Magog come from the north, only that Magog is from there. Another objection centers on Gog. How can these be two wars 1000 years apart when the same guy is leading them? That's not a problem. We constantly find in the Bible different people with the same name. Take Avimelech, for example. There are five in the Bible (Gen 20; 26; Ps 34; Jdg 9:22; 1Ch 18:16). Two of them seem related as Abraham (Gen 20:1-18) and Isaac (Gen 26:1-22) both dealt with a Philistine king of Gerar having this name. Probably this was a popular name for Philistine kings much like Pharaoh was for the Egyptian ruler. Similarly, the Gog of Ezekiel 38 and 39 can be different men sharing the same name or title (as some Bible commentaries teach). You may have noticed that throughout this article I never once attempted to identify Gog or Magog. By skipping the customary search for their identity and instead carefully comparing these two chapters to other parallel prophecies, the timing of the prophecy's two (not one) wars is easily and confidently identified. Yet by now, like me, you perhaps are no longer concerned about who Gog and Magog are, anyway. If you agree that Ezekiel 38-39 speak of two wars and you see that the first is Armageddon that involves "all nations" (Zech 14:2, 16) already, then Gog is just one of many nations in that massive battle. The battle is the important thing and the result, not the leader. If you get that the second war is the post-mil revolt and that it is so far in the future after an unprecedented time of peace and prosperity, then you know it really has no bearing on the geopolitical scene we understand today. So what concern is it who is the leader Satan stirs up to make trouble then? Only prognosticators using current events to interpret prophecy need to be troubled with Gog or Magog's identity (and we know how unreliable those interpretations have been). Perhaps the very naming of Gog and Magog in these prophecies at all (so that people would want to identify them) indeed was the curve ball God used to confuse these prophecies for so long. One thing is for sure, the second Gog of Ezekiel 39/Armageddon, is not the Antichrist himself. The Antichrist is thrown in the lake of fire (Rev 19:20) but the second Gog is buried (Eze 39:11). Perhaps if this rules out Gog being the Antichrist, he is the top military general of the Antichrist...one of the Ten Rulers? Note: If you thought the Gog Magog War(s) relate to the coming M.E. war, consider Psalm 83 instead .